I was driving past a McDonald’s in Ireland last week and it got me thinking about the farthest distance you can be from a McDonald’s in Ireland. This has been attempted by others before me for the UK and the United States etc. but I can’t find anything on Ireland so I will give it a go. 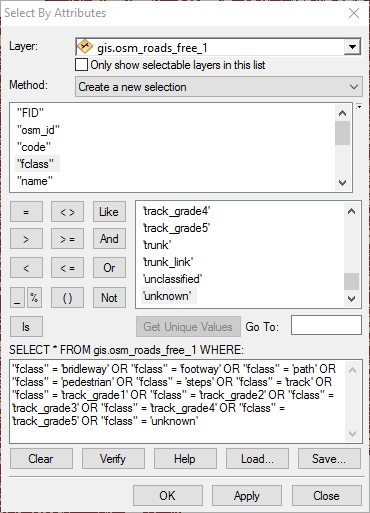 This post is just a quick post on how to download the relevant GeoJSON file. I will use overpass-turbo.eu to download the McDonald’s locations. 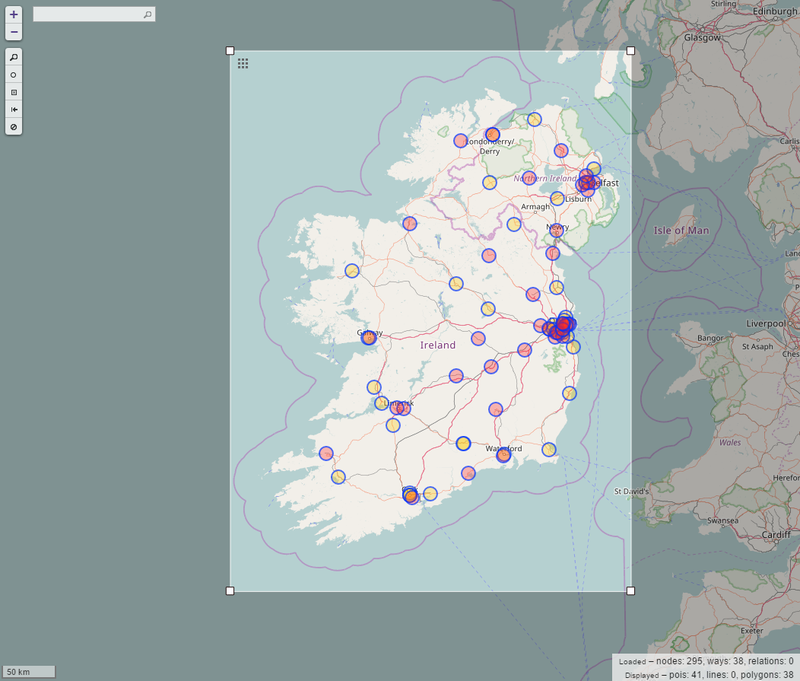 I then used the wizard to look for McDonald’s in Ireland, created a bounding box for Ireland and ran the query, the below was the result. 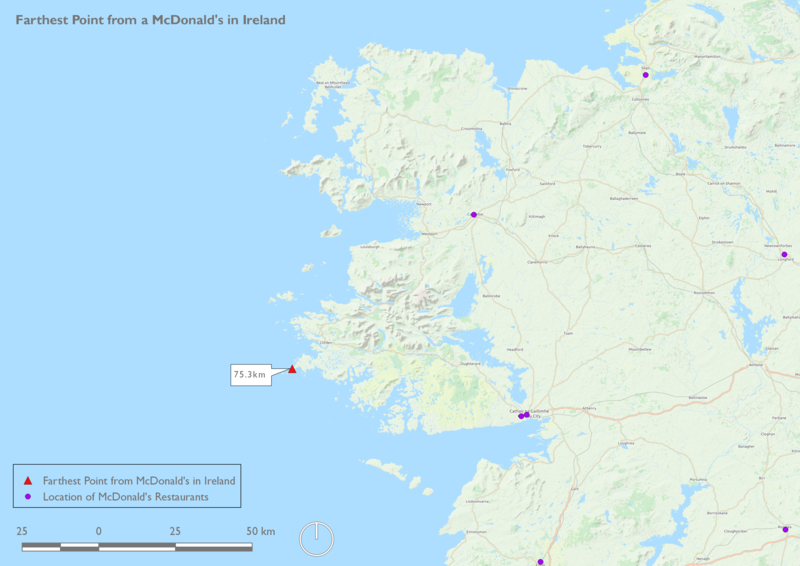 This was then exported as a GeoJSON file, in my next post I’ll load this as a table into a PostGIS database and find the farthest point from a McDonald’s in Ireland. I recently read an article by Mark Jenkins in the Guardian celebrating 100 years since the foundation of the US National Parks Service. In this article he seeks the help of a GIS specialist to find the most remote place in the contiguous United States. It turns out that this point is just over 20 miles from the closest road. I strongly suspect that publicly accessible land must have been one of criteria as the centre of the Nevada Test Site (Wiki article)is certainly farthest than the point they found. I have emailed the GIS specialist and asked him the criteria he used. I’ll update this post if he responds. OpenStreetMap view of the Nevada Test site. This got me thinking, if for an area as large as the contiguous USA (8,080,464.3 km2) the distance is so small what would it be for Ireland given that Ireland is 95 times smaller than it (8,080,464.3/84,421=95.7). I did some research to see if any greater minds than my own (read: ALL) have undertaken any research on this. The first (and in my opinion the most reliable) source I found was the United States Geological Survey (USGS). They have published a brief paper (link) where they give the distance to nearest road every 30 metres for the lower 48. They have also published an academic paper (Roadless Space of the Conterminous United States) that can be viewed for free if you register. The first thing to do was to acquire the administrative area of Ireland (for this I used the OSI’s landmask shapefile). 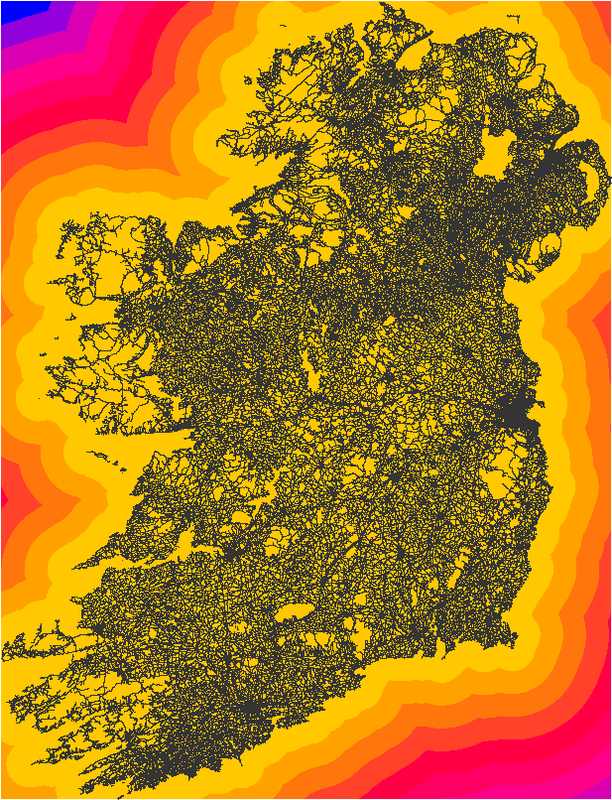 The next step was to download all the rivers and lakes of Ireland (these were downloaded from the EPA’s geoportal). The final step was data acquisition was to download the OpenStreetMap road network from Geofabrik. Once all these were downloaded, I could begin. The above features were selected from the roads layer in ArcGIS as shown below. The next step was to invert this selection and export it to a file geodatabase, 103,808 attributes were non suitable for this analysis. Once this selection was exported it was added to the map. A problem faced at this stage was that all of the roads for Northern Ireland were included. There were two maps to approach this problem, the first was to clip them to the extent of the Republic shapefile or the other option would leave them be and they would not be included by default when the zonal statistics was run as the zone would be the Irish shapefile. The second option was chosen for simply time saving reasons, from previous experience, a clip of the roads would take quite some time. 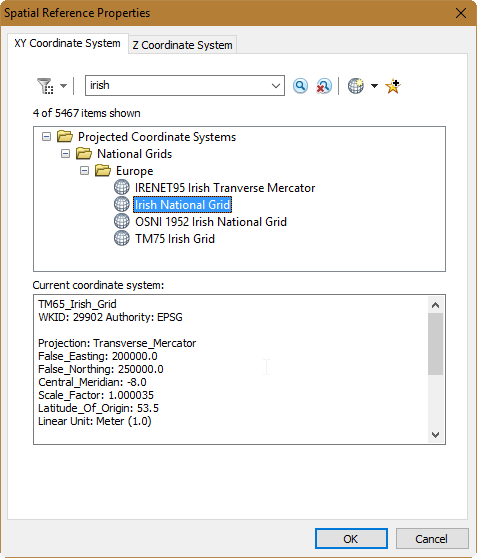 As all the data that was downloaded was in the geographic coordinate system WGS84 it had to be reprojected into TM65 Irish Grid (EPSG 29902). Everything was then exported to a file geodatabase to speed up future calculations. The next step was to calculate the Euclidean distance for the roads layer. This was done using the Euclidean distance tool in ArcMap. The main variable here is what cell size to use, obviously the smaller the cell size the more accurate result but this comes at the expensive of processing time and file size. I chose a 30m cell size as I felt this would strike the right balance. This operation ran very quickly and the resulting raster with the roads overlaid is shown below. With this raster each cell has a value based on its Euclidean distance from the road polyline. For the purposes of this exercise, the islands were discounted as I was only interested in the main landmass of Ireland. The islands were removed. The next step was to calculate the zonal statistics, the zone in this case was the Ireland polygon and the statistic that was calculated was ‘MAXIMUM’; this would tell us the cell that was the maximum Euclidean distance from a road. 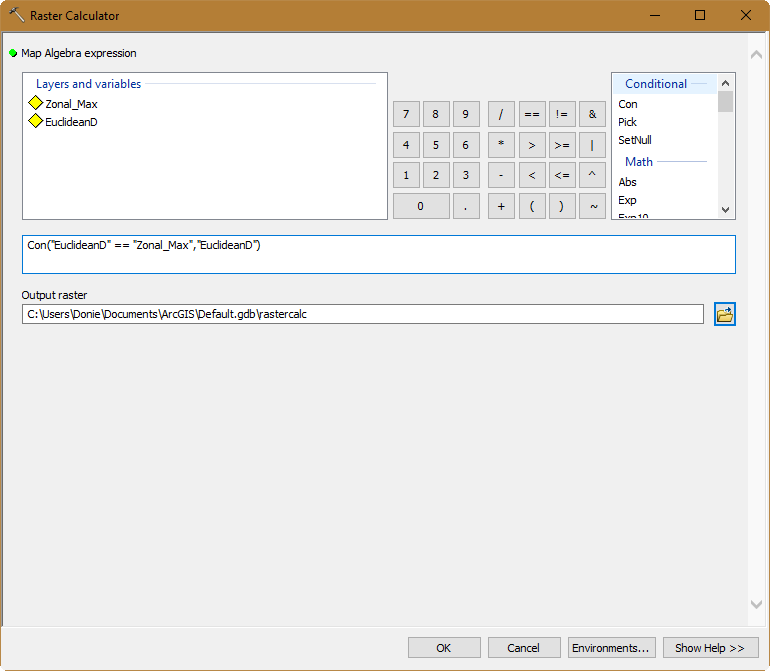 The zonal statistics tool creates a new raster with just the maximum value present. This raster was then used in the following equation to calculate the locations where the distance equals the maximum distance. This then generates a raster with only one value, this is then converted to a point using the ‘Raster to Point’ tool in the ArcToolbox. The result is shown in the image below. 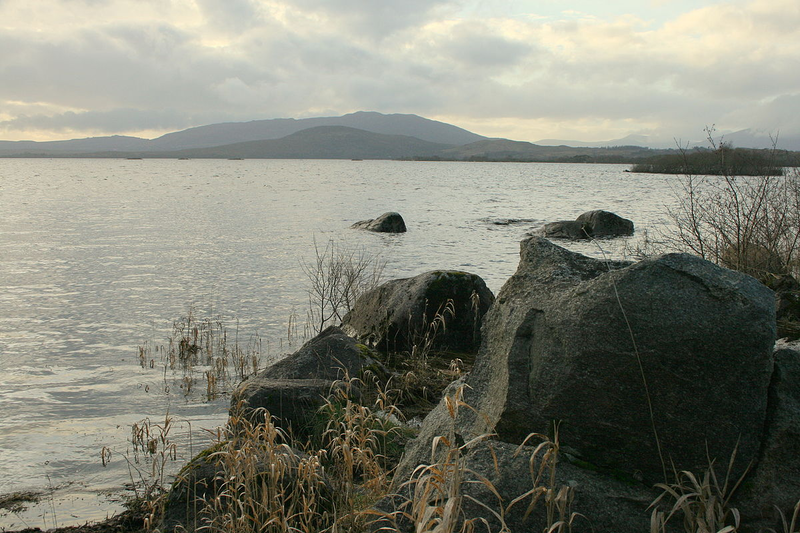 The farthest point from a road in Ireland is 6,760m from a road, it is in Nephin Beg Mountains in Ballycroy National Park in Co. Mayo, very close to Slieve Carr. 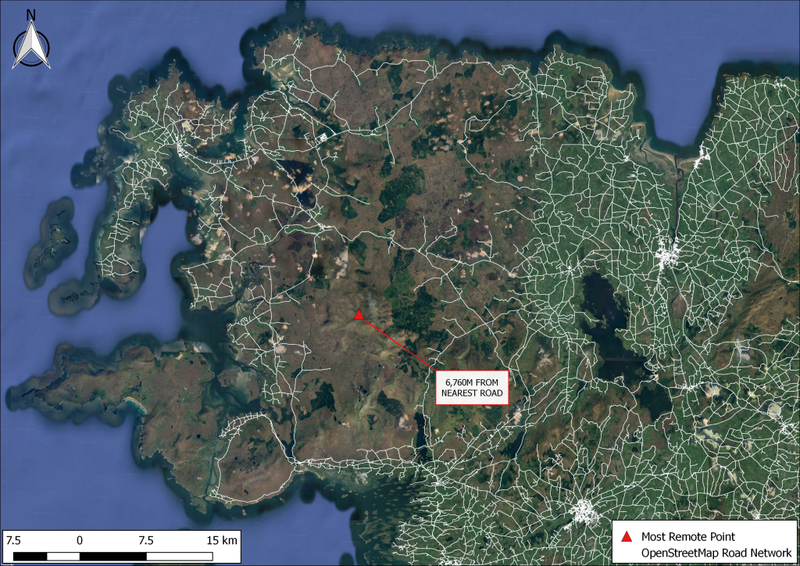 To put this in perspective, the farthest you can be from a road in Ireland is the same distance as between O’Connell Bridge and Farmleigh Park to the west of the Phoenix Park, a very short distance indeed! 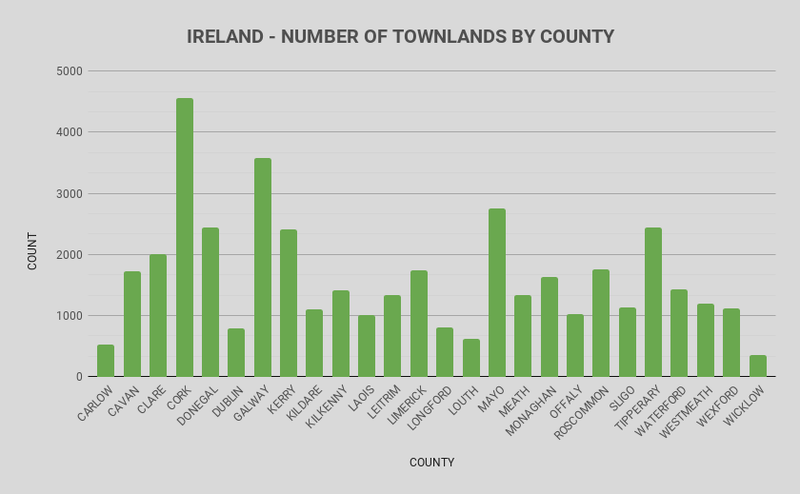 There are two drawbacks to my methodology, the data used from OSM is only as accurate as its contributors and I didn’t clip out the lakes and rivers of Ireland. I purposefully didn’t clip out the lakes and rivers because the end result would not have altered (as long as the point wasn’t in the middle of a lake at which point I would have clipped out the lakes). I welcome any criticism of my methodology and I’ve purposefully went into a minutia of detail so as to encourage constructive criticism. 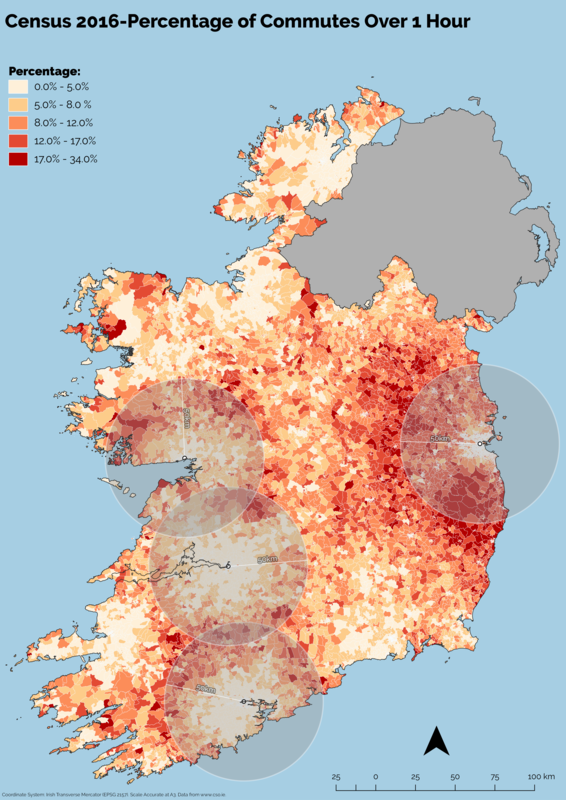 In anticipation of results of the 2016 Irish census I thought that it would be interesting to calculate the mean centre of population from the 2011 census. The data was downloaded from the Central Statistics Office website. The next step was to download the census boundaries from here. Once downloaded they were opened in ArcMap 10.2.2 and the Mean Center (sic) tool was used from the Spatial Statistics toolbox to calculate the mean centre with the total population for each small area used for the weight. 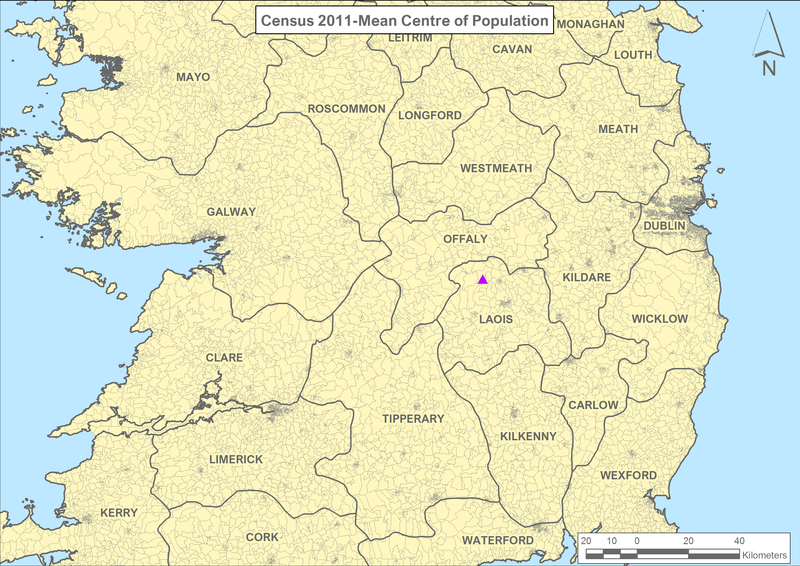 Below is the mean population centre for the Republic, it is located in the townland of Capard, Co. Laois.